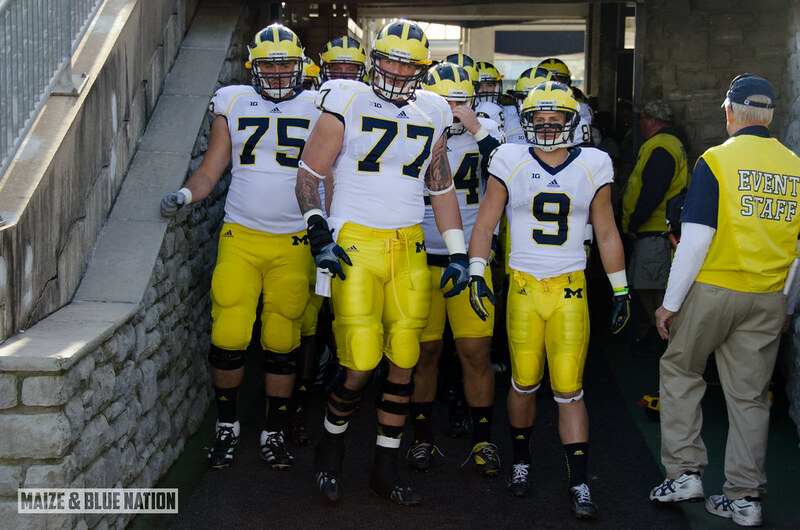 The expectation at Michigan is to win Big Ten championships. Anything less is unacceptable. Period. From day one, that was mantra Brady Hoke chiseled in stone. Maybe more than any M head coach before him, he puts all of his eggs in that Big Ten basket. And even though Brady Hoke never wants to make himself the story, by his own standard, because of their struggles on the road, his first two years in Ann Arbor have been a failure. Michigan leads the conference in league titles with 42. A number they've been stuck on for 8 years. The last time Michigan football was considered relevant in the title hunt was in 2006 when an undefeated #2 Michigan team lost by 3 to an undefeated #1 Ohio State team, 42-39. Since then, it's been an up and down, but mostly down, roller coaster of triumphs and struggles. That loss in "The Game", followed by the three more in a row... to USC, Appalachian State and Oregon, sent this once elite program into a free-fall. Since Bo's passing on the eve of that fateful game, Michigan has accumulated an overall record of 49-36 – hardly a record worthy of the Michigan Football legacy. Michigan sent Lloyd Carr packing after 2007, then went way outside the box and hired Rich Rodriguez, fired Rich Rod three abysmal years later, and finally went back to the formula that worked so well for all those years. Brady Hoke, a Michigan Man, has been pretty much given the time he needs to right the ship in Ann Arbor. Flying out of the gate with an 11-2 record which included beating Notre Dame and Ohio State, going to and winning a BCS bowl...has appeased the Michigan fanbase almost universally – a fanbase that was severely splintered following the great Rich Rod experiment. The consensus was that Michigan Football was "back". For a while there, it felt like it, especially on the field. But that early success yesterday's news. Since 2011, Michigan has continued their impressive unbeaten streak at home, 19-straight and counting, but road games have been hit and miss. When matched up against what I would consider the upper-crust of the Big Ten – Ohio State, Penn State, Michigan State, Nebraska – Michigan has struggled away from Ann Arbor. One of the most frustrating things Michigan fans have had to endure since The Game in 2006, is to sit and watch the Buckeyes amass a 71-16* record, including a 6-1 record against Michigan. It's been a harsh look in the mirror for the Michigan program over the these last few years, and to see Ohio State assume the position of superiority in the Big Ten has been the twist of the knife that Michigan didn't need. But it's not just the Buckeyes who've soared while Michigan has stumbled. Michigan State, maybe more than any other program, have enjoyed the fruits of Michigan's struggles. They took advantage by knocking off the Maize & Blue four years in a row from 2008-11. Mark Dantonio, as much as we all love to hate him, has been the right man in the right place at the right time for Michigan State. No doubt about it. Mark will always be remembered for his hatred of Michigan, no matter what else he does in his career. And I think he's fine pinning his reputation on his success in this game. Jim Tressel did it, and he's still adored in Columbus. That might also have something to do with central Ohio's drinking water, but nevertheless. For Michigan, the Sparty rivalry has been elevated to a pedestal almost as high as the one with Ohio State. Now, there's no looking past the Spartans. For some Michigan fans, that's a bitter pill to swallow. There's been a consensus over the years in Ann Arbor that the Michigan State rivalry is that other rivalry behind Ohio State and Notre Dame, at least on a national level. I'm from Ohio, and I can tell you that it wasn't until I moved to Michigan 9 years ago that I fully grasped the impact of this rivalry. It's just not discussed outside of the state of Michigan. But I think that's starting to change. This year's matchup will be broadcast nationally at 3:30 on ABC. That tells you something. It tells you that people will be watching this game. For Michigan, that's nothing new...they're used to the bright lights. But what's troubling is that we're getting uncomfortably used to watching the Wolverines struggle on the big road stage. And that stage, for this rivalry, couldn't possibly be any bigger than this. Both teams are neck-and-neck for the Legends division and you just get the feeling that these two programs paths are diverging, and the first to flinch will have a rough time gaining ground. This season especially, with everything on the line, this game will clearly define the current state of the Michigan Football program. That's what a bitter in-state rivalry should be all about. This is a crucial time for the Michigan program. For Brady Hoke and his Wolverines, the time is now to stop talking about a Big Ten title, and deliver one. *Including the 12-1 record from 2010 which was officially vacated. But those games still happened so let's not pretend they didn't.